That’s why these Cheery Cheesecake Bars are made with a luscious but easy Home-made Cherry Pie Filling. That filling is smoothed over a layer of cheesecake all atop a crispy shortbread crust. Best of all, a bit of that shortbread is saved out to sprinkle over the top of everything and forms a crispy, crunchy streusel-like topping. These bars are a thing of beauty. There’s no overly cooked, overly sweet filling in these tasty bars. If you’d really rather, go ahead and grab a can or jar of cherry filling and I’ll never tell…but take 15 minutes or so, sit down and find your zen pitting cherries, and I think you’ll thank me later. A cherry pitter isn’t expensive and really makes the job go easier – and some little medical type gloves help keep your hands from getting stained. I used Bing cherries and they’re big, dark juicy cherries. They cooked up to a jammy deliciousness. I can also really see a smaller red cherry or a sour cherry in these bars, too. I think they’d be perfect for any summer holiday, then: all red & white. Buy whatever cherry is in season or on special. Stock up on cream cheese and butter during any holiday week (freeze if necessary) and pay about half price for it. When the next holiday rolls around, do the same. If you go with a canned filling, look for sales with coupons (again, you’re likely to find them during holidays), especially big baking holidays like Christmas and Easter. Note the base is baked and cooled before the bars are assembled, and after cooking, the bars are at their best chilled. Preheat oven to 375 degrees F. Lightly spray a 9×13″ baking pan. Alternatively, in a medium bowl, whisk together the flour, sugar, baking powder & salt. Use fingers, two knives or pastry cutter to blend in the butter until crumbly. Then add the egg and mix together well. (Mixture will still be crumbly). Press about two thirds of the dough into the prepared pan, building it up just a bit on the edges. Pat dough as evenly as possible, and press down gently but firmly. Bake for 10 to 12 minutes or until the bottom has puffed just a bit and the edges have picked up the slightest bit of color. Set on a wire rack to cool completely before proceeding. Using an electric mixer, beat the softened cream cheese & sugar until smooth, two to three minutes. Add the eggs, one at a time, beating and scraping the bowl after each until just incorporated. Add the almond extract. Spread the cream cheese mixture gently over the cooled crust. An offset spatula is handy for this. Spoon the cherry pie filling in an even layer over the cream cheese mixture. Crumble the remaining dough evenly over the cherry layer. Bake for 45 to 50 minutes, or until the top is light golden brown. Cool completely to room temperature, then chill if desired. Bars may be kept for several days in the refrigerator. Note: we preferred the bars chilled rather than at room temperature. I’ll be bringing this recipe to Fiesta Friday 178. Stop by and see all the fun posts and recipes (hint: you may find something for the 4th of July) and stop back on Tuesday to vote for you favorites. This entry was posted in Click here for Fabulous Food Posts and tagged Brownies & Bars, Cheesecake, Cherries, Cream Cheese, Desserts, Fruit Desserts, pie filling. Bookmark the permalink. I think you have made up my mind what I am making today to take to my family reunion this weekend. I might also make blueberry. Looks Yummy! Happy FF! Yes, the expectations are high. I actually ended up making a Salted Caramel Dump cake, a Cherry Black Forest Dump cake and Blueberry Cherry Bars which ended up being more like a spoon dessert. No blog worthy photos since I made them in disposable half steam tray pans. I didn’t want to bring back and dishes. The reunion was fun but glad to be back home. Sorry to be so behind in my comment replies! I will cohost soon, promise!! Taste of Home is published bimonthly (every 2 months) so you should be getting 6 magazines for the year. I’m relieved you got your first edition, I think it should be ok, just takes time in between. 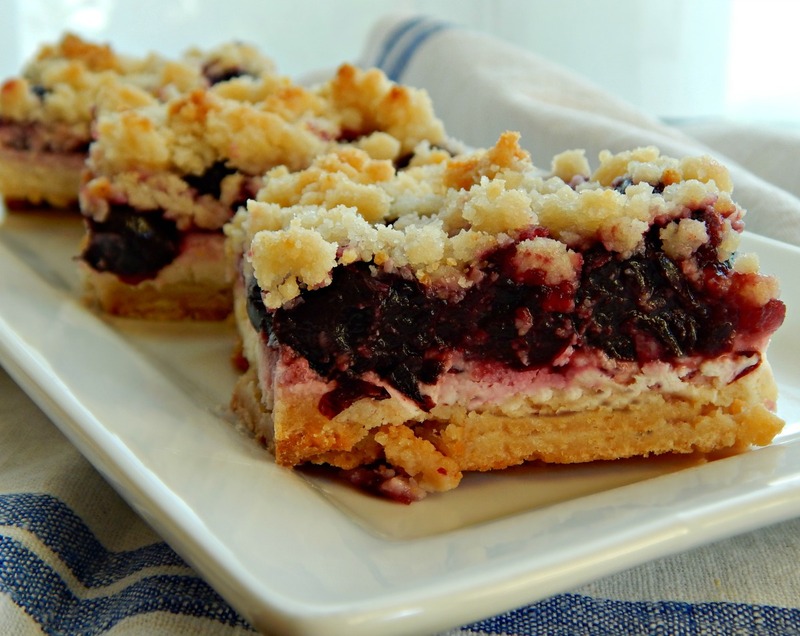 Molleen, your cheesecake bars look DIVINE! I really don’t like store bought cherry pie filling but your home-made version sounds delicious!! These look delicious! I may have to make a cherry dessert after gawking at these. We picked blueberries at a farm last week and they had tart cherries too. I may have to go back and get some to make a dessert. I love that you used a homemade cherry pie filling. Another great recipe Mollie! Thanks much! I used to be such a chocolate freak but I have really broadened my horizons in the last couple of years. These are sooo good I found myself snitching little slices! Cheesecake + homemade cherry pie filling? I am in! These look fantastic! I may need more than one slice. 😀 Have a lovely weekend, Mollie! I hope you had a great one, Jhuls. Many of us here in the US are getting a 4 day because the fourth of July (Independence day) is on Tuesday! So why not take off Monday, too, lol! Beautiful version with the short bread Base. Nice post Mollie. Thanks Sumith! I seem to have trouble getting to your blog. Maybe I’m just not figuring it out? Thank you Molli for letting me know. I think I am having some problem with my server. Will fix that early as possible. Once again thank you. I’m with you on the cherry pie filling Mollie– too red! This really looks delicious–how could it not be with the added cream cheese! hugs to the best cook! Looks good– not so so sweet as the canned stuff — and this year we are awash in adorable cherries for some reason… Love the bars recipe!! They were crazy good, Chef – and they weren’t even chocolate, lol!! Sad! I love cherry pie filling! But I bet the homemade version tastes way better. lol, Colleen – you’re entitled and I do get a little judgy now and then, lol!! It really is good and so simple except for the pitting! Those look yummy and way better than anything made with bought pie filling which is always too sweet and too viscous. Home made is always way better. Yum, yum, yum! Love the idea of the shortbread base. And I can’t tell you how much I love cherries. This one is a winner, Mollie! What a delicious looking dessert. I’ve used E.D. Smith brand cherry pie filling for years. Not overly sweet and great right out of the can. But making your own cherry pie filling IS easy especially if you start with great tasting cherries. Thanks! It’s really good! I had to look E. D. SMith up. I know people who swear by Cracker Barrel Cherry Cobbler Filling, too.